The weather has finally started to cool down, and that means it’s the perfect time to get the kids outside for some active play. 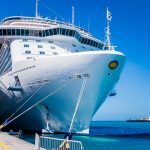 Summer was spent in the sprinklers, at the pool, or at the beach, but the crisp fall air allows you to be active without the need to cool off in the water. 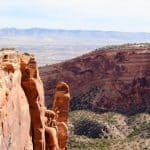 One great family friendly activity for this time of year is bike riding. And being prepared with the right gear can make for a much more comfortable and fun ride for everyone. 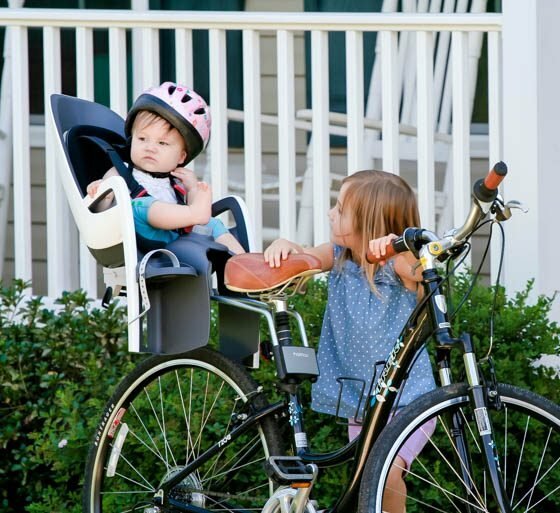 For your littlest riders, a bike seat is a key accessory needed. But how do you know which one is the right one for you? 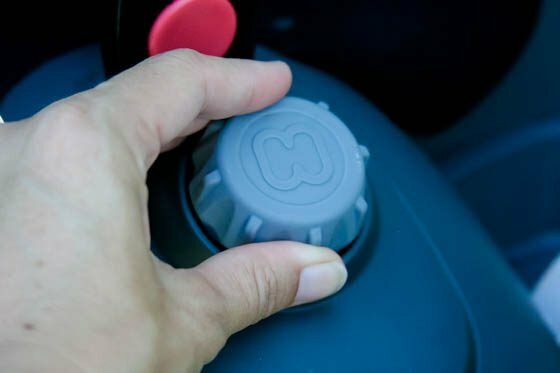 Hamax is an innovative child road safety company that offers high quality, safe bike seat products for your family. 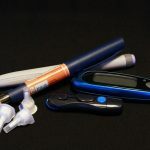 They have several different options depending on your needs and the needs of your child, and it’s important to look at the features of each seat to ensure that it works for your bike and for you. Below is a list of key features to look for when you’re transitioning your bike from a one-seater to a two-seater. 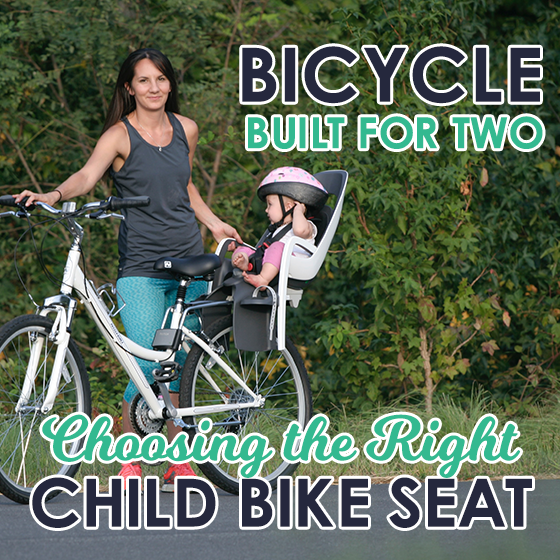 The first thing you will want to decide when looking for the best bike seat for your child is where you would like your child to sit. There are two options for this: either on the back of the bike or on the front of the bike. If you decide you would like to place your child on the back, there are two ways to do this. The first option is to use an attachment directly to the frame. The second option is to attach the seat to a luggage carrier attached to the back of your bike. The luggage carrier is a separate option that can be purchased or is often found on rented bikes. A front placement option for your child’s bike seat is great if you have an older child that would like to be right in on the action. 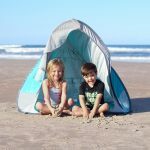 The Hamax Observer gives your child just that with an additional wind shield to protect from rain, wind, and insects while riding. 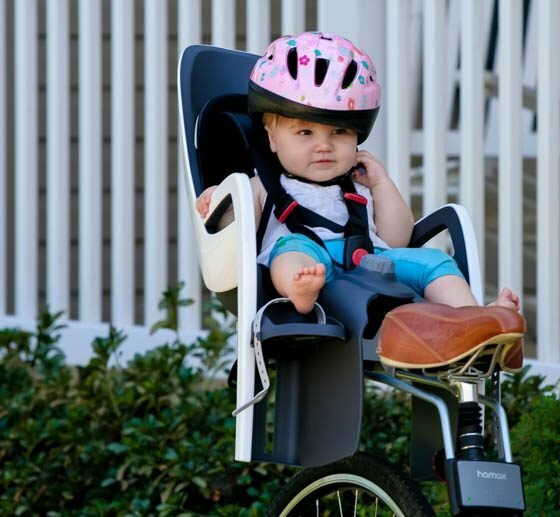 The Hamax Caress is a back of bike placement, great for parents who want unobscured vision while riding or for adding a seat in the front and back of the bike. The Caress is also available as a frame attachment or for use with a luggage carrier. Check out the infographic below for more information about these seats, and read more below to find out how to choose the right seat for you. 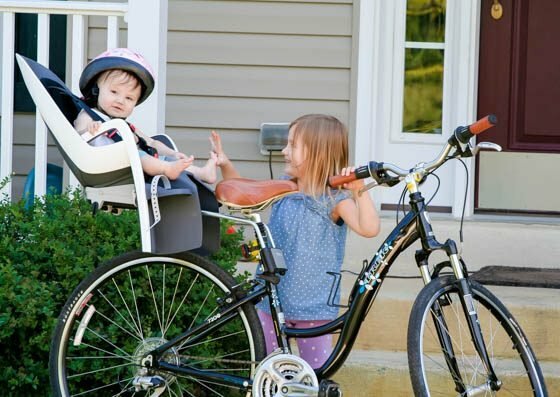 The next thing you need to look at when researching a child seat is your bike. There are key features that are different for each bike and for each seat, so you need to determine which seats meets the requirements. Once you have determined where you would like to place the child seat (either on the front or the back of the adult bike) and how (either by attachment or luggage carrier), you can research the required frame sizes needed to attach the seat safely. 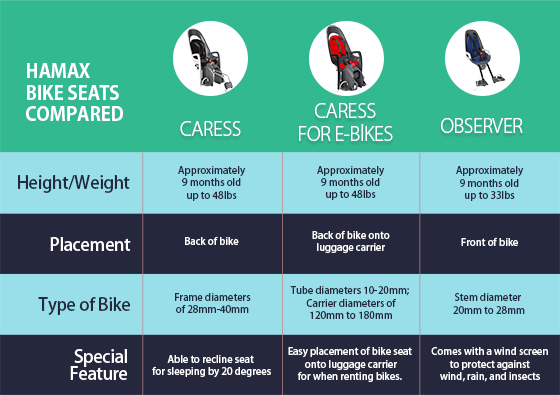 Each child seat has a different diameter requirement when being placed on the bike, so you will need to measure your bike frame or luggage carrier to ensure the seat you choose will fit. Hamax child bike seats fit most adult bikes easily. Since they offer options for seats in the back or the front of your bike, as well as seat options for luggage carriers on the backs of bikes it is imperative to check what you need to measure and where you need to measure it before you purchase. 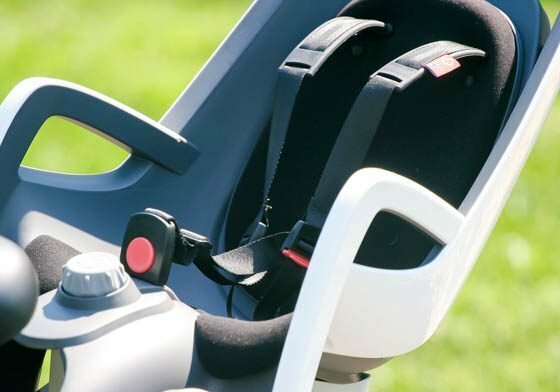 Safety is a top priority when researching any sort of seat that your child will be using. When it comes to child road safety, Hamax is a leader in testing the quality of their seats to ensure that their riders are safe and secure. Given the variety in options, it is important to look at the features of the seat to make sure that it works for your child and for you. When researching the different bike seats for your child it is important to look at the height and weight requirements. 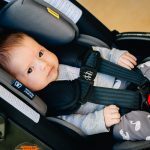 Just like carseats, these options vary, and choosing an incorrect one can compromise the safety of you and your child. Each Hamax seat has a different suggested weight requirement for each seat. Check out the infographic above for more information. There are a few things to look for when checking that your seat will stay secure to your bike. One of the first things to look for during your research is the size of the frame required for the child seat. Again, this varies for each type of seat depending on its placement on the bike (front or back) and if it is designed to fit luggage carriers. 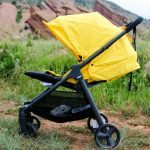 Once you have determined the size of the frame or carrier, you can then figure out which seat works best for you. 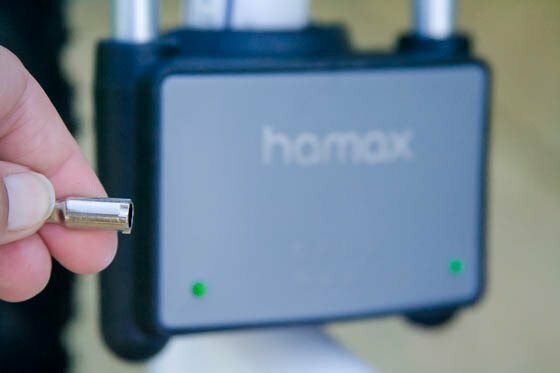 Several of the Hamax seats offer a lock and key security feature to ensure that the seat is attached properly and securely. For the Hamax Caress seat with the bow and bracket attachment, there is a key that fits into the back of the bracket. When the bike is secured with this key, the lights on the front of the bracket run green, letting you know the bike is securely attached to the frame. 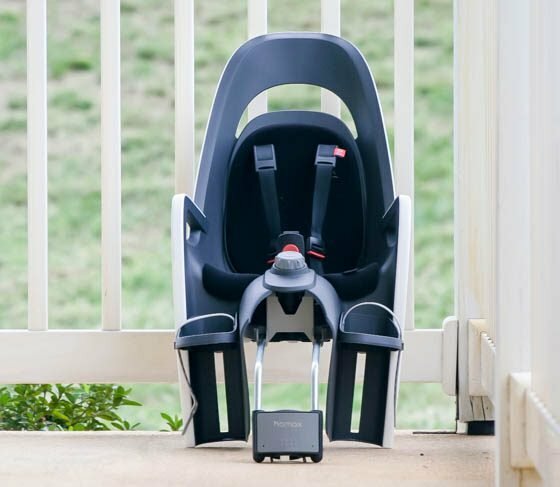 Hamax child seats are all designed with a harness system to keep kiddos snug in their seat. The harnesses are adjustable to the size of the rider, and each harness is latched with a secure buckle system. 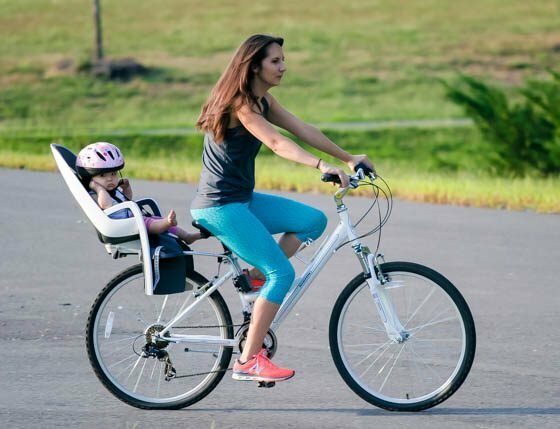 And in order to make sure your child doesn’t give you a swift kick while pedaling, Hamax child bike seats have adjustable foot rests for your child. Each foot rest is able to be altered to fit your child’s foot so they stay securely in place while you are in motion. There is also a reflective light on the back of the seat for added safety while riding in low lighting conditions. 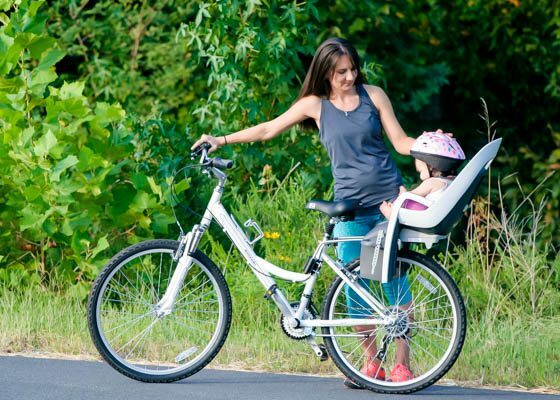 Each Hamax seat is designed to ensure the safety of your child while riding. Be sure to always put a properly fitting helmet on your child while they are in the seat. Always stand next to the bike while your child is in your seat even if you are not riding, as the weight of the seat can tip the bike over. 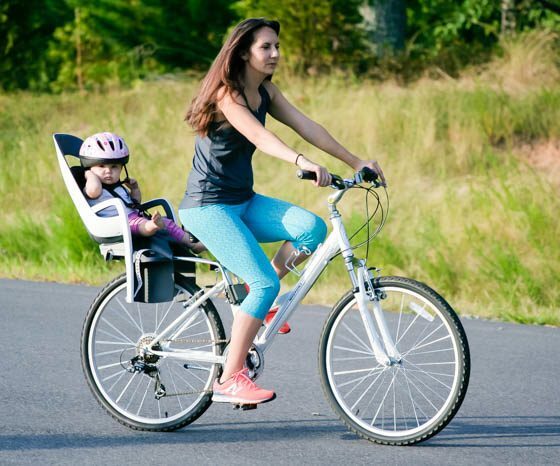 Comfort, of course, is key when going on a bike ride with your child. After all, they are more likely to be happy if they are comfortable! Hamax offers a variety of features in their child seats to make sure that the littlest riders are comfortable – even while sleeping. The Hamax Caress seat offers comfortable padded seating and a padded harness system to make sure your rider is sitting in the lap of luxury. 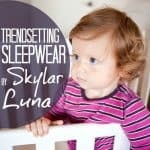 It also reclines easily by a simple turn of the knob on the front of the seat by 20 degrees so if your little one decides to snooze they will be comfortable. 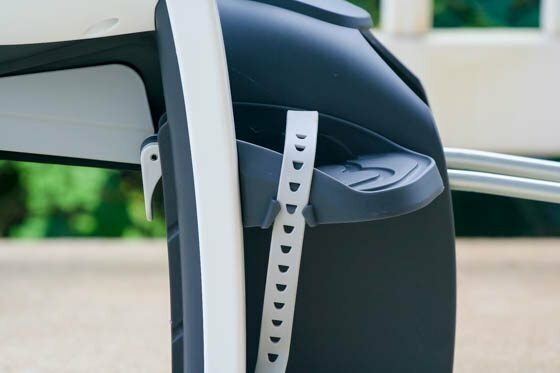 The adjustable foot rests not only keep their feet secure but they also can be changed by height so their legs are in a comfortable sitting position no matter if they are 9 months old or a preschooler. 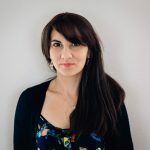 As families grow so does their laundry list of things they need to help manage their little ones every day. 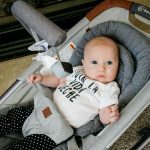 There are so many options when it comes to carseats, strollers, highchairs, and all the other gear, that it can be hard to sift through all the different features to find the one that works for your family. 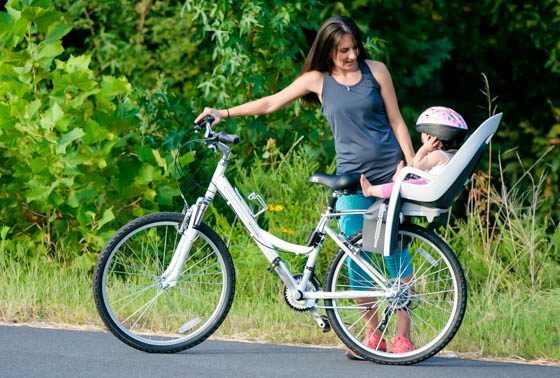 If you are an active family who loves to do things outdoors, you can add things like child bike seats to the list of things you might need. 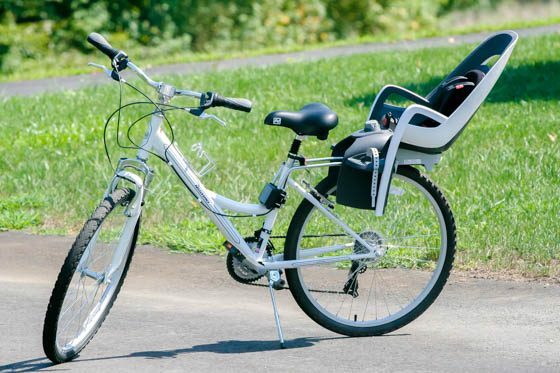 Hamax child bike seats are a great addition for your family’s biking needs as they provide options for everyone. Be sure to take a look at our infographic above to help you decide which seat is the best for you. 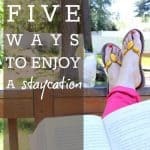 To read more about ways to be active with your family, check out this post on Crossfit for Families: Benefits and Bonus Home Workout.